Is this what passes for a survey and damp proofing report? How damp proofers sell unnecessary DPC injection work. Fig 1. Typical of the Reports used by the damp proofing industry to sell unnecessary retrofit DPC injection work and re-plastering. 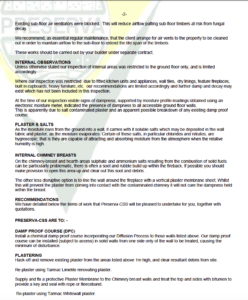 We’ve had to do one inspection this week and one detailed survey relating to production of a Part 35 compliant expert witness report; in both cases this involved checking a survey Damp proofing report that were recently provided by an East Midlands damp proofing company, Preserva. 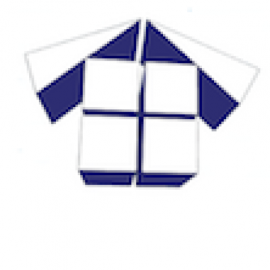 Our last involvement with this company was when we were called to re-survey a property in Nottingham after the same company had diagnosed rising damp and hacked off all the low level plasterwork from the clients walls up to waist height. It was at this point the client got suspicious and called us in. What we found was that this company had done no diagnostic work to prove that rising damp was present, they further stated that a damp proof course comprised of blue engineering bricks had failed and failed to point out where the damp proof course was bridged by soil banked against the wall. 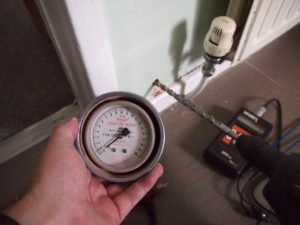 We did the diagnostic work and in fact proved that the property did not have rising damp, or indeed any significant moisture present at depth in the masonry. The property was suffering from chronic condensation damp and we specified works to deal with this issue. Preserva reinstated the plasterwork at their own expense and my client saved circa £2500 by not having unnecessary remedial treatment carried out for rising damp. We’ve said this before but if you invite a CSRT ‘qualified surveyor’ into your home then you invite a chemical salesman into your home. It took me many years to get letters after my name, whereas the CSRT (Certificated Surveyor in Remedial Treatment) can be achieved in three days with no previous experience of buildings or surveying, but apparently after three days they are now experts in damp. Despite damp proofers specifying remedial work for rising damp, there was no significant moisture present at depth. Never has the word apparent been more incorrectly used because quite clearly it wasn’t apparent since no diagnostic work had been done. The ‘surveyor’ had not carried out salts analysis to prove that salts were present in the plasterwork and in fact there was no salt migration visible on inspection of the plasterwork. 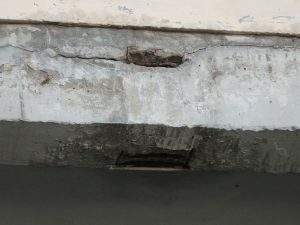 Additionally, he had not carried out testing to prove that moisture was present at depth in the masonry; this is a pre-requirement before even suggesting that the existing damp proof course has failed. He briefly discusses moisture profiles despite the fact that you cannot obtain any useful moisture profiles using an electronic moisture meter and further fails to even mention what that moisture profile is! Is it a rising damp moisture profile, a reverse rising damp moisture profile or just a random profile? We’ll never know but since he specified unnecessary remedial work for rising damp then I think we can assume it was a rising damp moisture profile. 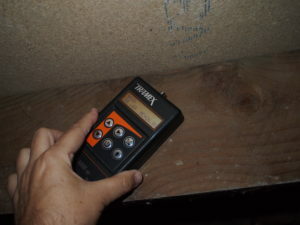 Critically, since it was only a relative reading then the results are unreliable and more importantly they are only moisture profiles at the wall surface. 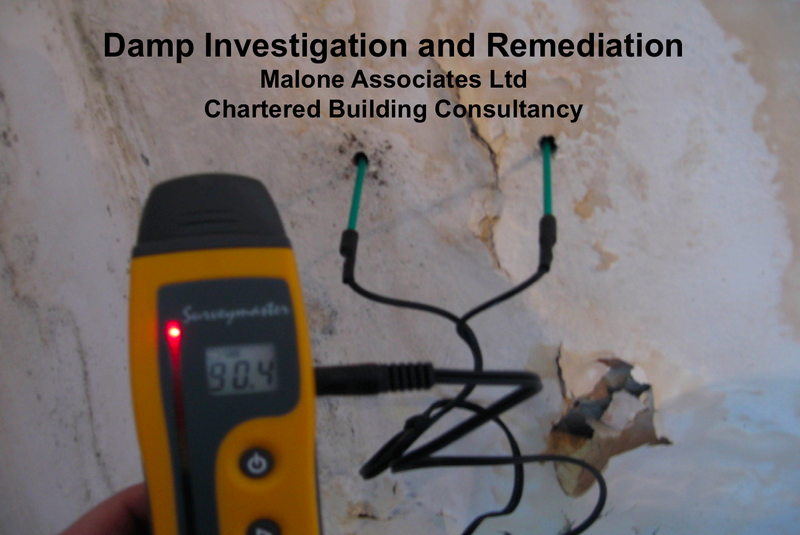 Even scan meters can not provide useful or reliable moisture profiles at depth in the masonry, and this is what we are fundamentally concerned with when investigating the potential for rising damp. The unnecessary work quoted for as a result of this report would have cost the client £2996.00 plus vat and to add insult to injury they were expected to pay £75.00 for an insurance backed guarantee if they wanted optional long term protection on this unnecessary work. In fact these are reasonable but limited comments and whilst it’s reasonable to comment that buildings don’t have an existing physical DPC, this was not entirely true. The rear extension in fact had a physical DPC comprising of blue engineering bricks and there were a large number of other external damp related defects that were not commented on; probably because they would not facilitate the sale of retrofit chemical injection. 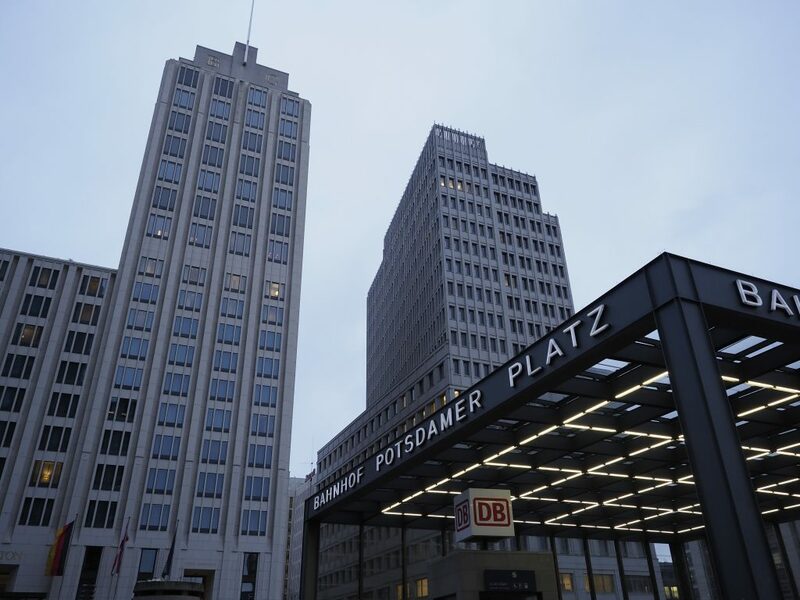 The main part of the building may not have a physical DPC, none was visible. 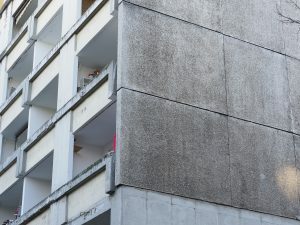 However buildings can manage moisture perfectly well without a physical damp proof course and in fact there are thousands of buildings in the UK that do not have a physical damp proof course but do not have a problem with rising damp. Timber moisture content of 26% means that timbers are at risk of timber decay. 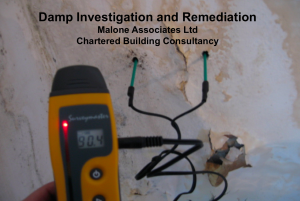 The operative word here is “could”… works were specified for rising damp on the basis that some dampness could be attributed to rising moisture from the ground, so again we see an assumption being made in the complete absence of any credible diagnostic results. Moreover, there were internal issues that would have been obvious to any reasonably competent surveyor, not least of which was incredibly high moisture content to the timber floor joists in the cellar. We do not know what the value of this work was but you can be sure that it was a substantial sum, we rarely see quotes of less than £2.5k for this sort of unnecessary work and frequently quotes are substantially higher. We have not yet encountered a case where the work has been required. Damp Proofing is Almost Never Required! You should view any report you receive from a damp proofing company with extreme scepticism. Mould caused by ineffective ventilation and poorly insulated loft space. In the absence of a modern whole house MVHR (mechanical ventilation and heat recovery) system, which few of us have, then your choices for how best to ventilate your property fall to single room options such as extractor fans or vents, or a PIV system may be recommended. The vast majority of properties that we deal with will rely on standard extractor fans, which more often than not are poorly chosen, poorly installed and poorly understood. In part one we explained why opening windows is a terrible idea for managing condensation damp and why is was crucial to place equal emphasis on managing heat losses as well as air changes. With that principle in mind, where extractor fans or single room heat recovery fans are installed, they should be wired to run continuously on trickle speed 24 hours a day with boost speed wired to the bathroom lighting circuit or pull cord. In our view fans with humidistat switches or over run timers are ineffective and we never specify them. Humidistat switched fans are particularly unreliable as the humidistat sensor often gets fouled with airborne debris. 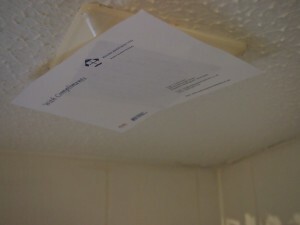 It is absolutely critical that there are no open windows, wall vents or trickle vents in any room containing an extractor fan because if there is, then the fan will simply draw air from this open vent, short circuiting the extraction process and preventing air changes in the property. The key is to ensure that air is being drawn from other rooms so ideally trickle vents should be open in other rooms not containing a running extractor fan. PIV did not directly save any energy but may save a little when compared to conventional extraction providing the same level of ventilation exchange. This is because roof space temperatures are usually a minimum of 3OC higher than outside. Input ventilation was found to be effective in reducing relative humidity levels by around 10%RH in the test house, even when internal doors were closed. Vapour pressures reduced overall by 0.2kPa. The unit was shown to be more effective upstairs than downstairs. In the field monitored houses input ventilation was not consistently effective in reducing relative humidity. When internal humidity levels over those outside was examined, PIV was found to be effective in the most humid houses but did little in the dryer houses. Even in the cases where it was effective there were often inconsistencies between rooms in the same house. 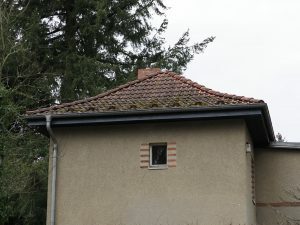 In both the test and occupied houses, the roof space was consistently more humid than outside (excess vapour pressure of about 0.1 kPa), implying that moisture was being transmitted to the roof space from the rooms below. The results showed this moisture transfer regardless of whether input fan was operating or not.This demonstrates that PIV may actually recycle higher levels of RH back into the habitable space. I’d be understating the case if I said that results were not particularly encouraging and an interesting point that was made is that the occupants perceived improvements or benefits were far greater than were actually proven. Clearly for some occupants there was a psychological benefit or placebo affect taking place. 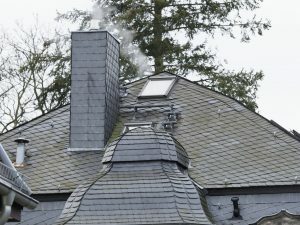 The last time I wrote about the proven poor performance of PIV I had damp industry salesmen stating their disagreement and commenting about how great PIV was and how they’d had a ‘masterclass,’ not just a class, but a masterclass in ventilation from someone at the BRE involved in this study but this doesn’t change the findings and we simply don’t ever specify PIV and have never needed to. Passyfier vents are a relativity new product, again of unproven reliability. Essentially they are an improvement on a standard open wall vent in that they are packed with rockwool which is moisture permeable but retains heat and prevents drafts within the property. 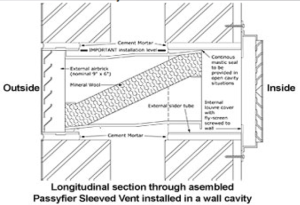 The tubing connecting the inner and outer face of the vent is sloped to the outer face of the wall to allow for drainage of any moisture that is collected in the rockwool packing. In their own right we cannot believe that these vents will provide an effective ventilation strategy but they have to be an improvement on a standard open wall vent since drafts and heat loss will be massively reduced. In fact where open wall vents are installed we have frequently packed these vents with rockwool insulation and received very similar benefits at very low cost. 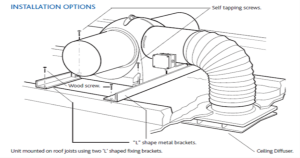 These are our preferred option for ventilation but are often ruled out due to cost. A good standard centrifugal fan may cost circa £70.00 whilst a single room heat recovery fan may cost around £250.00. However they do merit one or two words of warning. 1. Some units come with heat exchangers that occasionally require them to be removed and cleaned in Miltons fluid or similar; this may be a prohibitive requirement in specifying for the social housing sector. 2. Manufacturers claim amazing performance of up to circa 90% heat recovery but they fail to mention that higher efficiencies are only achievable at low trickle speeds. Heat recovery is incredibly poor at high speeds because the air moves across the internal heat exchanger too quickly. However given that we generally recommend continuous running at trickle speeds then this principle is perfectly geared towards installing, and getting the best from single room heat recovery fans. These can still be fairly effective in managing condensation so long as you avoid the pit falls that most installers fall into and follow our general principles for running extractor fans… silent & continuous running at trickle speed. 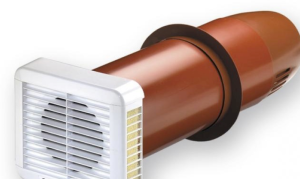 We commonly see cheap axial fans installed to ceiling mount locations, yet generally, axial fans are not powerful enough to move air through the length of ducting in the roof space. We generally specify a centrifugal rather than an axial fan (though high powered axial fans are available) because we know it will be effective for ceiling, as well as wall mounting. A crude but effective test we often carry out is to simply see if the running extractor holds a sheet of paper, if it doesn’t then in all likelihood it is ineffective. It is also critical that silent running fans are installed because if they are noise intrusive in operation then they will be turned off. We commonly see cooker hoods installed to deal with extraction at first floor or kitchen level but these are ineffective purely due to the noise they produce. They’ll be ran infrequently during cooking and often are not even piped to an external wall so actually contain nothing more than a charcoal filter to deal with cooking smells. They should not be viewed as a suitable replacement or alternative for a silent and continuous running extractor fan. Ventilation Strategy for Condensation Management. A functional extractor fan with common wiring arrangements fails to prevent condensation in this concrete block. I have previously outlined my views as to whether or not residents are responsible for condensation damp and we believe that they very rarely are. Residents cause humidity but generally speaking it is buildings that cause condensation and so it is critically important to understand ventilation strategy. That statement will make uncomfortable reading for those landlords relying on spurious claims that condensation damp is an occupancy issue. 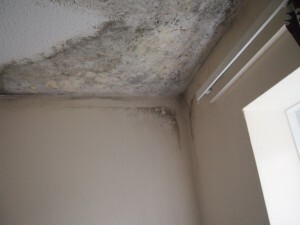 A potential client called me just this week and told me that her landlord, a large local authority in London, had refused to deal with dampness in her flat because it was proven to be condensation and therefore it was her problem and not theirs. Quite an outrageous position to adopt and one I’m sure will end up costing them considerably when they land in court. I’m sure that the flawed logic behind their position is that the occupant created the humidity and they simply have to manage that humidity by opening their windows and using their heating; advice that is clearly contradictory because it is akin to puncturing your petrol tank just after you’ve filled her up. You’d really like to keep that expensive petrol in the tank but you’ve been advised that the tank is safer with less petrol and more air so puncturing the tank works a treat. I hope my analogy illustrates the that fact that opening your windows in the middle of winter to manage condensation is nuts, and if anyone else ever gives you that advice you should tell them so. We know that old solid walled properties are thermally inefficient and suffer from thermal bridging. They are prone to suffering condensation damp because thermal bridging causes cold internal wall surfaces that are often below dew point temperature. Therefore warmth and heat retention is an equal consideration to achieving air changes within the property. We know that warm air holds more moisture than cool air so an increase in ambient temperature will immediately reduce the internal humidity levels. Lets say that we have a room temperature of 20°C and an internal humidity of 80 percent, if we turn the heating up to 25°C then the internal humidity immediately reduces to circa 60 percent thereby reducing the risk for condensation. The secondary benefit is that this increase in ambient temperature will raise internal wall surface temperatures and may well raise them above dew point temperature, which is another substantial risk reduction, and bear in mind we’ve not even thought about air changes yet. If we adopt the more common approach of opening windows to achieve air changes something quite different happens… Again imagine that we have a property with a room temperature of 20°C and an internal humidity of 80 percent. It’s chilly outside with external temperatures of only 3°C but we open the window anyway and this allows cold air to immediately enter the property, reducing the ambient temperature and further chilling the building fabric possibly below dew point temperature; this in itself is an increased risk for condensation. Air at 20°C can hold 15 grams of water vapour per kilogram of air but since the ambient temperature has now reduced, lets say to 5°C, then the air can now only hold 5 grams of water vapour per kilogram of air. 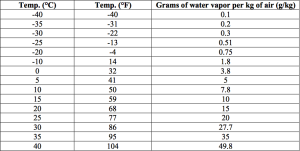 So what happens to the missing 10 grams of water vapour? Well quite simply it is immediately given up as transient condensation within the property, the cooling effect of incoming air is so quick that humidity does not have time to exit the building. Transient condensation is what frequently occurs in bathrooms when occupants open windows after a shower and the immediate effect of transient condensation convinces everybody that the steam exited the window but in fact they have been fooled. If it is cold outside and you open a window it will cause transient condensation and of course also results in very high levels of expensive heat loss. In simple terms, uncontrolled ventilation (open windows or air bricks) is a very bad idea whilst controlled ventilation is a very good idea. 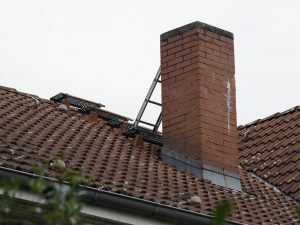 Efficient ventilation and air changes are important in a property but it should not be achieved at the expense of substantial or acute heat loss within the property. 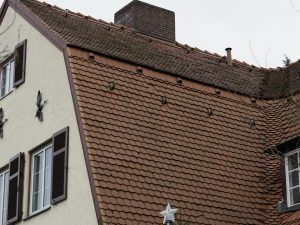 There needs to be a balance between achieving the required air changes within the property and a parallel objective to manage or spread heat losses over a longer time period so as to significantly reduce the risk for transient condensation. 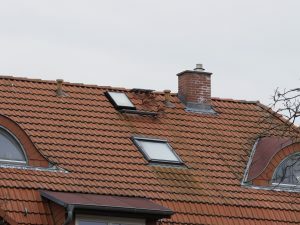 An effective ventilation strategy will account for heat losses within the property as well as air changes. In part two I’ll discuss the types of ventilation available, and how best to use the more commonly available methods of ventilation. We’re all heard of woodworm, the term used for the larvae of the destructive furniture beetle, precisely for the reason that they can be destructive but there are other forms of infestations not generally considered harmful that you may not be aware of, the plaster beetle is one such visitor. Of course, if you’ve suffered from a plaster beetle infestation then you’ll be well aware of this pest. We recently took a call from a client asking for advice on a plaster beetle infestation in a new build property. 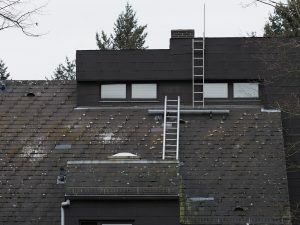 The constructor had called in a pest control company who had fumigated but the client experienced re-infestation within two weeks of the treatment. The couple were told by the council’s environmental health department to open the windows and turn up the heating, which made things worse. “Barratt said it had never heard of this method and recommended we used fly spray. I was using 10 cans a day – and still they kept coming. We discovered orange mould under a picture frame and thick green mould under the sink,” says Jane. What we noted from this newspaper report is how badly the homeowners were advised and how wide the difference of opinion as to how these pests should be dealt with. 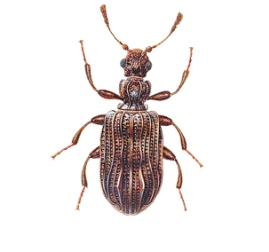 Since plaster beetles thrive in damp conditions then they are more prevalent during the wetter seasons but essentially, if you have damp conditions that lead to mould colonisation then there is a small risk of plaster beetle infestation. They have been a particular problem in some new homes where properties have been handed back to new owners without being properly dried out; particularly where properties have been flooded due to careless plumbers; an issue we have seen many many times in new build. Residual construction moisture can be a temporary issue in new build properties but in the main, properties should be relatively dry unless there is or has been some additional underlying issue. 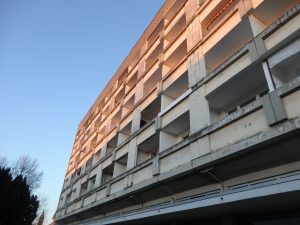 Indeed, it may be that the building fabric is relatively dry but you are suffering from high levels of relative humidity that support fungal growth. Interstitial condensation can be a particular problem since mould formation can occur in hidden voids, thereby providing a hidden food source for beetle colonisation. Plaster beetles can be anything from 0.8mm to 3mm in length and have a life cycle of 13 to 28 days. Adult beetles deposit their eggs near a food source (mould) and when larvae emerge they feed on the mould spores before eventually pupating into adults. Pupation can take up to five months dependent on the availability of food. 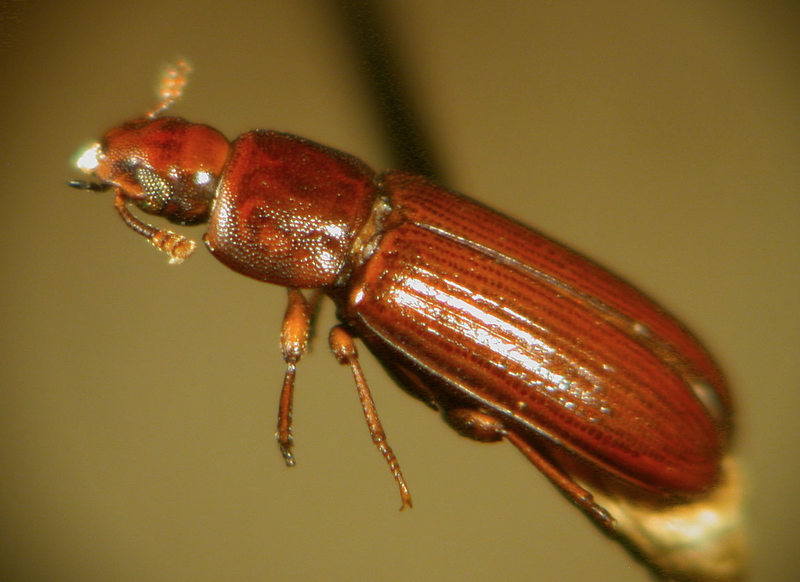 Some types of plaster beetle are reasonably good fliers and can be attracted to light, which is why you may see them congregated around a light source or near windows. Generally speaking we are not great believers in chemical treatments and prefer to deal with infestations like this in a more natural way that avoids spraying harmful chemicals in the home. Since plaster beetles feed on mould and mould is caused by damp conditions in the home then doesn’t it simply make sense to deal with the issue at source by removing the source of moisture and the source of food? Chemical treatments can never deal with the underlying cause of the problem, which is dampness and subsequent mould colonisation. Moreover we simply do not like the idea of spraying harmful chemicals in the home and the chemical effects will reduce over time, thereby requiring re-treatment since the underlying cause has not been addressed. 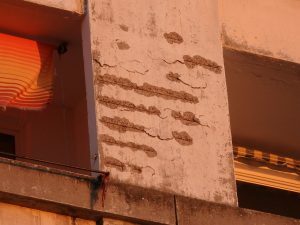 There is also an option of heat treatment, whereby the property is heated to 45 degrees C. This temperature should kill off any plaster beetle colonies in the home but again our main concern is that this does not address the underlying cause so there may well be a risk of re-infestation. Ongoing management of high relative humidity in the home. The source of moisture may be a plumbing leak, penetrating damp or condensation damp and if you are in a new build property, you may simply have to deal with temporary construction moisture by promoting rapid drying. You may want to consider hiring snail fans to dry out walls and a dehumidifier to mop up the excess humidity. If this is not successful then it is likely that you have a more significant underlying source of moisture that needs identifying. 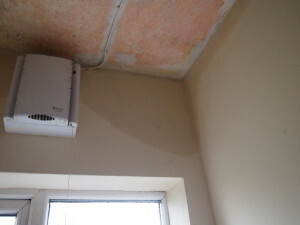 If mould colonisation is obvious then treat this with a proprietary fungicidal spray to help eliminate the food source and where plaster beetles are seen then they should be vacuumed as frequently as possible to help manage the population whilst the underlying cause of dampness is being addressed. 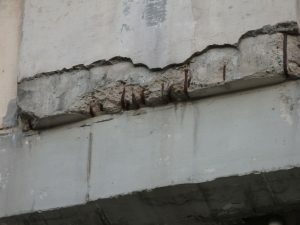 The underlying cause won’t always be obvious, in which case you may need to call in a Chartered Building professional. If you call in a pest control or damp proofing company then you should expect to be sold chemicals or heat treatments, money that would be better directed towards correct diagnosis of the underlying cause of moisture. As an aside to this blog, we were recently asked to advise on a flour beetle infestation in a kitchen. The client complained of frequently seeing larvae on the kitchen worktops but had no idea what they were or where they were coming from. Similar to plaster beetles, they are another relatively innocuous, but nonetheless unpleasant visitor that can invade kitchen foodstuffs, particularly flour and cereal products. However, the issue of seeing larvae only on kitchen worktops gave us a strong hint as to the source of the problem… “Do you have a toaster on the kitchen worktop,” we asked? “yes, we have a double toaster” came the reply. We advised the client to open up the toaster and clean out all the old breadcrumbs that had accumulated in the base and sure enough it was packed with two years worth of breadcrumbs and a flour beetle infestation that was completely eradicated once the toaster was cleaned out and the food source was eliminated. Some of these toasters have cleaning trays in the base that can be removed for cleaning but they are simply not up to the job. Of course we’d completely understand that many would prefer to simply throw the toaster away rather than clean it out but we’re not advocating mass toaster disposal without first checking that this is the source of the problem.